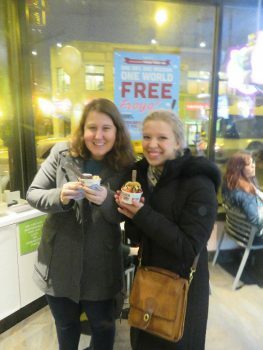 On Monday, after a long weekend of studying, my roommate Mallory came to me with some big news: Yogurtland was offering free frozen yogurt for national frozen yogurt day! Naturally, we took the “L” downtown at rush hour to get our own cup of goodness. There, we r an into many other Chicago Semester friends and took a tour of their Canterbury Apartment. It was nice, but I really enjoy La Casa since it is so close to my school, has more of a neighborhood feel, and its more spacious. The rest of the week went by in a blur and before I knew it Friday had arrived. I struggled to keep up with lesson planning, evaluations, grading, and everything else this week. It is a lot to manage and I didn’t even get to start creating lesson plans for edTPA until Friday. I did film my class just to introduce them to the video camera so they wouldn’t goof around too much when I start filming on Monday. They were pretty silly and cute as I walked around and they each took a moment to dab, pretend they were melting, or say “hello” in a funny voice. I will be saving that video to remember them by. 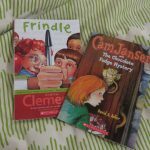 I took over reading and writing this week, which meant that I introduced Frindle to my students. To my surprise, they loved the book and many of them wante d to read it the next day when they had time to read independently. I even had one boy come up to me and ask if he could read the next chapter at home. I told him he could, but that he had to stop there and he couldn’t tell his classmates what happened next. It was exciting to see their genuine interest in the story and characters. My guided reading group was also captivated by Cam Jansen and The Chocolate Fudge Mystery. They begged me to keep reading and to finish the book on Thursday with them. We kept stopping as we read to make predictions which they were eager to make and see if they were correct. On Friday, before they started reading with Compass Learning I had them answer a few questions about the story and they were all able to tell me the characters, what the chocolate fudge mystery was, and their favorite part. Overall, I was pleasantly surprised to find tha t they were interested and eager to read. sitting in her living room. I was glad to see them after a long and stressful week. We ended up going to the Half Shell as a belated birthday present. 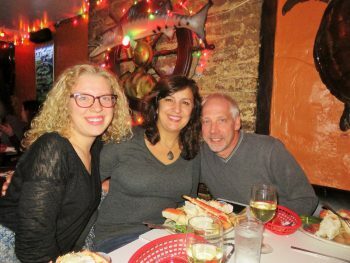 My parents had always talked about taking me to this quirky, dimly lit, crab leg joint, but it had never worked out– finally that day came! We spent the night laughing, cracking crab legs, and sharing stories from our week. This week I will teach my edTPA lessons on summarizing and take over teaching science for 222. We’ll see what surprises this week has in store! For more on Sarah’s experience click here.